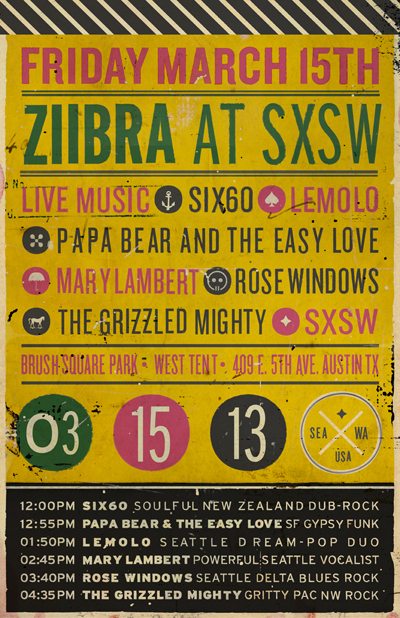 Creating posters for South By Southwest events is always a fun typography challenge. There typically is a sea of text to be included on these kinds of posters. As a graphic designer, my goal is to organize that content in a fluid, easy to understand manner... while devising an eye-catching design aesthetic. Our friends at www.ziibra.com recently reached out to us to do just that. If you haven't heard of ZIIBRA you should definitely check them out. The Seattle web start up has created a platform for artists and fans alike to engage with each other. ZIIBRA helps up-and-coming artists make music their full time job, by connecting them with true fans who want to back their careers (think bandcamp meets kickstarter). 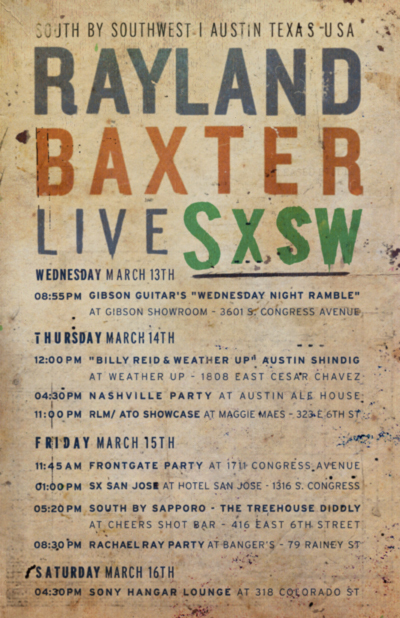 ATO recording artist RayLand Baxter also hit us up this week. The Nashville-based singer/songwriter is on the big come up in 2013, and appears to have a full SXSW performance plate ahead of him. Listen to RayLand's debut album Feathers & Fishhooks HERE. And if you're in Seattle, unable to attend any of his sets at SXSW, see RayLand live at the Crocodile March 29th with Donavon Frankenreiter. Cheers, FYM.